ESD workstation | Modular workstations | Apzem, India. Apzem Modular series ESD workstation are ergonomically designed, heavy duty ESD workstation for medium to Large electronics Labs and Industries handling ESDS boards and components. Static charges generated by turbo charging or by friction on humans and other insulated materials should be properly dissipated before bringing in contact with sensitive Electronic components and circuits. Apzem Modular series ESD workstation is designed with a aim to provide complete robust ESD safe work environment with complete modular design that boosts maximum customization, productivity and safety to sensitive electronic components and circuits. Construction:All our modular series ESD workstation / Table are made of heavy gauge Aluminium profile providing greater strength and longer life. Since complete workstation is made of standard heavy duty Aluminium profile, manufacturing, customization, Assembly / Dismantling is made in shortest time. 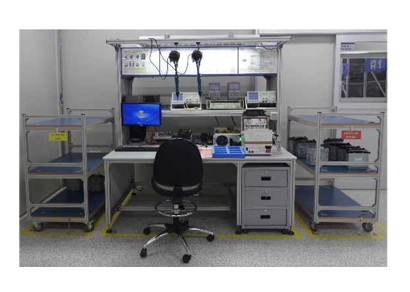 Table Top : All Apzem modular series ESD workstations are by default provided with one inch thick post formed ESD Laminated marine wood table top. Storage: All Apzem Modular ESD Workstation comes with standard three draw storage cabinet on either side / or on one side on request. MOC: made of Standard heavy duty Aluminium profile.